11th century, Tabo, dukhang, cella, overall view, painted clay, photo by Jaroslav Poncar. 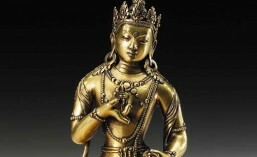 The central statue in the sanctum is one of Amitabha/Amitayus, with a red body and both hands in the meditation gesture. Because he is seated on a lion throne, normally used for Vairocana or Shakyamuni, some scholars have argued that the original image probably depicted Shakyamuni. Could it be Shakyamuni represented as Amitabha? At any rate, he has a prominent chignon/ushnisha topped with a lotus bud proper to a buddha, mixed with long strands of plaited hair and princely jewellery, including armbands worn high up, seen on bodhisattvas. 11th century, Tabo, dukhang, cella, detail, painted clay, photo by Christian Luczanits. Above him, various figures among the vines, including this dancing one dressed with a colourful knee-length dhoti. 11th century, Tabo, dukhang, cella, Avalokiteshvara, painted clay, photo by Jaroslav Poncar. On one side of him is Avalokiteshvara in his padmapani form (the lotus no longer in his left hand), expressing supreme generosity with his right hand. His hairstyle is very much the same but the jewellery is different. 11th century, Tabo, dukhang, cella, bodhisattva, painted clay, photo by Jaroslav Poncar. On the other side, Vajrapani according to some, Mahasthamaprapta according to others. The latter, generally absent from Tibetan and Nepalese art, is usually depicted with Amitabha and Avalokiteshvara, which would confirm that the main image is the original one (see Dilwar Ram in Monastic art along the Western Himalayan trade routes – Gonpas and Lakhans, Himachal Pradesh University, chapter 4, on http://shodhganga.inflibnet.ac.in/bitstream/10603/121050/12/12_chapter%204.pdf). We will note, however, that the way he holds his hands corresponds to Vajrapani. 11th century, Tabo, Byamspa Lakhang, west wall, Maitreya, painted clay, photo by Helmut Tauscher. In another temple, Maitreya as the buddha of the future, his hands symbolically turning the wheel of dharma . This entry was posted in Clay & others, Himachal Pradesh. Bookmark the permalink.